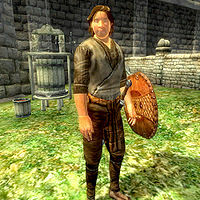 Ambroise Canne is a Breton viticulturist in the employ of the Surilie Brothers in Skingrad. He sleeps in his house in the southwest corner of Skingrad between midnight and 6am before heading to the Great Chapel of Julianos where he prays to Dibella for two hours. If the weather is dry, he will head to the yard behind the Surilie Brothers' house and stand there between 8am and 1pm and also from 3pm until 8pm; otherwise, he will head home and wander around his house. Between 1pm and 3pm he eats lunch at his current location, although since he has no food on his person he will only eat at work if somebody provides him with food. The same applies during his dinner break between 8pm and 10pm. Between 10pm and midnight he will wander around his house before heading to bed. He is an advanced trainer in Block, but will not offer any training while praying, eating, sleeping or working in the vineyard, so on non-rainy days, the only time he will train you is when he wanders around his house between 10pm and midnight - which makes rainy days the best bet for training, as long as you don't catch him during any of his meals or when he is sleeping. Ambroise wears a lower-class outfit consisting of huntsman leather pants, a coarse linen shirt, and oiled linen shoes, along with a leather shield and steel longsword. He also carries his key, a tiny amount of gold, and a rake and hoe that will respawn if stolen. The first time he meets you he will announce "I am Ambroise Canne, grape-grower for Surilie Brothers. I'm also an advanced trainer for weapon and shield parries." Ambroise is a little smug regarding his ability compared to the Fighters Guild trainer in block and will say "Fadus Calidus [sic] at the Fighters Guild also teaches Block, but he'd be the first to admit I'm his superior in every way." As an advanced trainer, he is one of two NPCs that will start the quest for Block Master Training, the other being Lum gro-Baroth in Chorrol. Once your Block skill reaches 70, speak to him and pick the training option which will trigger the quest and this dialogue: "You want more training? Then you'll have to find Andragil. I learned most of what I know from her. I think she's living in Bravil these days. You should look for her there." The people of Skingrad will announce that "Ambroise Canne is really good with his shield. Even better than Falus Calidus [sic], I think. ", "I learned quite a bit about how to use a shield from Ambrose [sic] Canne. Cost me a bit, but it was worth it. ", "If I could use a shield as well as Ambrose [sic], I'd charge people for training, too." and "I've heard he's the best in town with a shield. If you want to learn, go to him." Block Training: Demonstrate to the Master of Defense that you are proficient enough to receive her training. Ambroise's confusion between Fadus Caldus, Falus Calidus and Fadus Calidius only appears in the subtitles; he will pronounce it correctly while speaking. The reason Ambroise stands around idle in the Surilie Brothers' yard is that the "weapons unequipped" flag is not set on his AI package, meaning he never gets the chance to equip his rake. Additionally, even if he were able to use his rake he would end up raking the Surilie's path rather than their garden. His refusal to offer training is also a bug. There are a pair of AI packages called "TrainerSkingradSurilieBrosVineyardWork" and "TrainerSkingradSurilieBrosYardWork" that were presumably intended for Ambroise, but they are unused and suffer from several problems themselves. Esta página foi modificada pela última vez à(s) 05h16min de 26 de abril de 2013.